When you need to come to a quick halt on the road, you need your brakes to work properly. Those feet, or even inches, can be the difference between safety and injury, a scare and an accident, a sigh of relief and a long insurance battle. Servicing, maintaining, and repairing your brakes should be at the top of your priority list. If you are in need of brake repair in Stoughton, WI, then look no further than Conant Automotive, Inc. Ever since opening their doors they have been held in high regards to their attention to detail and customer service. They may not be the biggest shop in town, but they provide the best service. When it comes to brake repair in Stoughton, WI, they don’t only do the bare minimum, but they go above and beyond. They take great care in assessing each individual brake repair situation and counsel each customer on how to proceed and if they need to be provided with alternative solutions. They know your time is important, so they conduct this high level of service in a timely fashion as to get their customers back on the road safely. 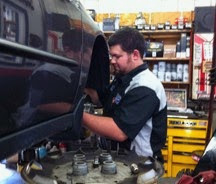 Brake repair in Stoughton, WI is what Conant Automotive, Inc. does. Their team of expert and certified technicians is waiting to be of service. Don’t let any doubts of your brakes’ ability to perform keep you worrying. Coming to that quick stop shouldn’t become a what if situation. Safety or injury should never be a question when it comes to brake repair. If you are in need of service, convenience, and great customer care, then take your vehicle or fleet down to Conant Automotive, Inc. for brake repair in Stoughton, WI.